1. Cook the eggs in a pan of boiling water for 8 minutes then drain, cool and shell. 2. Meanwhile, grill the bacon for 3 minutes on each side until cooked through and browned. 3. Chop the eggs roughly then, using a fork, mash together with the mayonnaise and mustard. Stir in the cress. 4. Lightly toast the bread and place a lettuce leaf on 2 of the slices, top with the tomato and the grilled bacon. Spread the egg mayonnaise onto 2 slices of the toast and place on top of the bacon. Finally, place the remaining 2 slices of toast on top. Secure with cocktail sticks then cut each sandwich diagonally in half. Delicious served with Waitrose Mixed Beetroot Crisps or Vegetable Crisps. 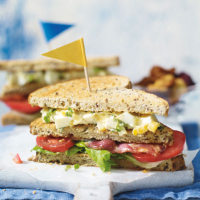 Save time with a prepared filling-try essential Waitrose Free Range Egg & Bacon Deli Filler.